More than 10,000 people ran the 10th Brighton Marathon today (Sunday 14 April) with big crowds lining the streets and the seafront to watch the race. And more than 3,000 people took part in the BM10k mass races, with about £6 million raised for charity, the organisers said. Cornish runner Peter Le Grice, 31, set a new British record, crossing the line in 2 hours 16 minutes and 23 seconds. His time was five minutes faster than his personal best and 2 minutes 10 seconds faster than the previous record. Le Grice pulled away from the leading group early on and ran most of the 26.2 miles on his own in the sunny but cool and windy conditions. 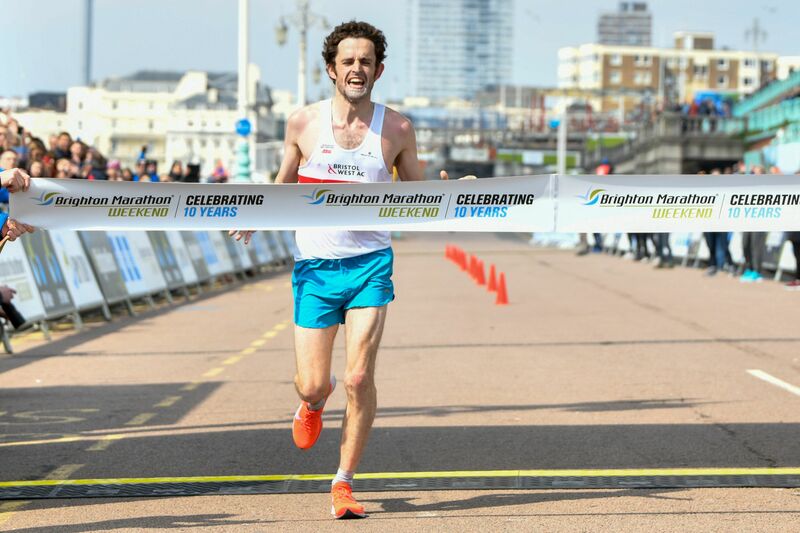 Crawley runner Paul Navesey, who trains in Brighton, came in second nearly two minutes after Le Grice, with a time of 2:18:17. 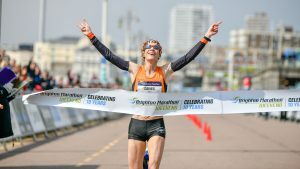 Ipswich Jaffa runner Helen Davies, 39, was the first woman to finish, retaining her title. She led almost from the start and won for the third year in a row, knocking four minutes off last year’s winning time. She crossed the line in 2:34:08 and was just over 14 minutes faster than the next finisher, Jill Collett, from Datchet, Berkshire, who recorded a time of 2:48:16. 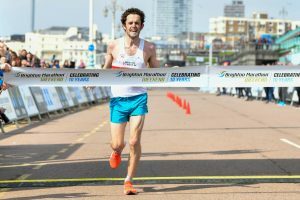 The BM10k played host to the England Athletics National Championships, attracting a strong field for the men’s and women’s races, so it was little surprise that two course records were set on the fast flat course. Nick Goolab, 29, took the English title comfortably. Goolab, who runs for the Belgrave Harriers, in London, smashed the men’s course record by over 40 seconds in a time of 28:22. In the women’s race, the former World Junior 1500m champion Steph Twell, 29, who runs for Aldershot, Farnham and District, set not just a course record but a personal best with her time of 31:58. For the first time the Marathon Weekend hosted a bike ride. The BM Ride drew more than 1,100 cyclists and covered 50km. Although it was not a race, Christian Faires, who rides for the Blazing Saddles, in Rustington, was the first to finish in 1:16:44. Yesterday the Cancer Research UK Kids and Teens Mini Mile races were held in Preston Park, with almost 2,000 children taking part. Everyone taking part – including the army of race weekend volunteers – drew thanks from Beverly Sawyers, vice-president of the Marathon’s “community partner” American Express. She said: “We’re proud to have backed the Brighton Marathon Weekend since the start in 2010. This year’s 10th anniversary event has been amazing for the Sussex community. “It’s also been great to see many of my Amex colleagues come together to enjoy sport, support local charities and celebrate individual achievements.